Puppet and Drama book with two Enhanced CDs - includes 32 customizable puppet skits that can be used with puppets or as a live drama. Enhanced CDs include 3 to 5 minute prerecorded segments to alternate with the Bible Connection DVD. 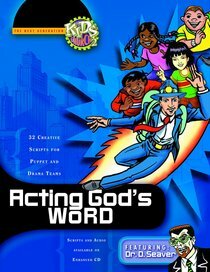 About "Amazing Journey Acting God's Word (Kids Church Series)"